I arrived that morning at the nunnery of Thiksey, set up eight years ago by a Dutch foundation to house nuns who had nowhere to pray and receive knowledge. The foundation also built a small guesthouse, where nuns host travellers and the income is used to financially sustain the nunnery (unlike the Buddhist monasteries in the region, the nunneries hardly receive any donations). I didn’t know then that instead of leaving in 2-3 days as planned, I would end up spending my entire Ladakh trip interacting, praying and introspecting with the nuns. The nunnery at Nyerma village. My conversations with the young nuns are awkward at first; I’m trying to tread the thin line between curiosity and appropriateness, and they are meeting a Hindi-speaking traveller for the first time. I slowly gather that these five young nuns, of which the youngest is 6 and the rest 11-12 years old, arrived at the nunnery last winter from Zanskar. As expected, the decision to become nuns wasn’t theirs; in some cases, an aunt proposed it to the family, and in others, the parents couldn’t afford to feed and educate their many kids. Either way, the nuns seem to have embraced their destiny with poise, something that my rebellious self still finds difficult to accept. We break the ice gradually. They are always eager to use my camera and iPhone and impress me with how quickly they learn to use these gadgets despite their isolated lives (See: From the Lens of Ladakhi Nuns). They ask me to help them study Hindi, a language that wasn’t given much emphasis in their old school in Zanskar. We play games they learnt back home and some that I recall from my childhood. Playing a Dutch game with the Ladakhi nuns and Dutch travellers. There is a clear leader in their troop of five, and when she lets her guard down, the others quickly follow. Like one evening, when my phone catches the rare signal and a friend calls me, they teasingly ask me whose the boy calling! On another occasion, they tell me about an 8th grader in school who always teases one of them, maybe because he likes her. In such moments, I forget that they are nuns, and observe that when the elder nuns aren’t around, they like to forget for a little while too. My image of their lives was never perfect, especially when I learnt their age. However, I found consolation in knowing that thanks to the Dutch foundation and the nunnery, they will atleast have regular access to school and food here, something they wouldn’t be assured of back home. But that consolation wasn’t enough. Truth is, their lives are harsh and rigorous. They wake up early for prayers, spend the day at school, work in the vegetable garden in the afternoon, study and do homework in the evenings, help with cooking at night, and must pray and study before they can sleep. At an age where even a child given much love by her family finds life difficult, these young nuns have only the elder nuns to see them through, and a teacher-student relationship is hardly a substitute for a parent-child relationship. A few years later, if they decide they don’t want to be nuns any more, I don’t know if the community will support their choice. Even so, there is innocence in their laughter, as though assuring me that they’ll be just fine. Hope the innocence in those eyes never goes away. On a Sunday, while returning home from an outing, I take them to the village shop to buy them chocolates. They shyly refuse at first, then the troop leader steps up and confesses to me their love for Wai Wai, instant noodles that can be mixed with spicy seasoning and eaten raw. Each one is delighted to devour her own packet, but every time we spot people on our walk through the village, they hide the packets in their robes. Can you imagine maroon-robed nuns relishing Wai Wai?, they joke. 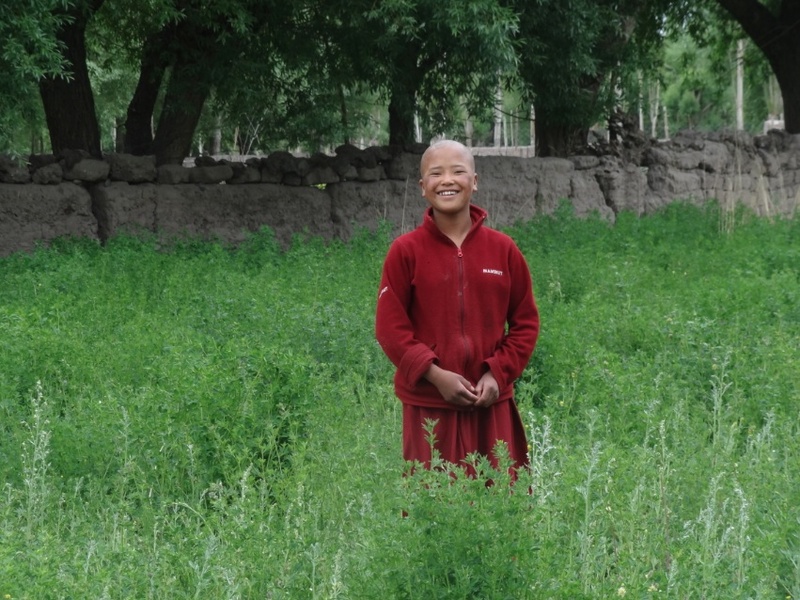 When I ask what they miss most about their homes in Zanskar, they giggle. When I insist, they break out in Ladakhi, shutting me out of their lives, like a stranger trying to peek too far in. I notice that they are terribly scared of the nunnery’s head nun. Her appearance makes them leave conversations, games, even Wai Wai (!) mid way. At one such instance, when we are midway through Science homework, they make me promise to come see them after dinner at their room in the nunnery. A little scared of the head nun myself, I tip-toe in, to their dorm-like room with five floor mattresses, bare walls, and a window overlooking the vegetable garden and the mountains beyond. They are no longer in the mood to study, so we talk about our dream houses, parts of India that they might never have a chance to visit, and the sameness of life in the nunnery. Late at night, I say goodnight and step out into the darkness. The whistling wind gives me the chills. A million stars shine above. I stand speechless, when the young nuns begin chanting their night prayers. The innocence of their voices stirs something in my soul. On my last day, one of the young nuns asks me if I would write her letters when I’m gone. I nod. She makes me promise that I’ll write to all five of them, not just her. I take solace in knowing that no matter what, they will have each other. Or so I hope. On a cold and lifeless morning, I take my cold and lifeless heart, and board my flight into a cold and lifeless world far far away. Join The Shooting Star on Facebook, Twitter and Instagram for more introspective travel stories. Sometimes, words are inadequate to describe what one feels….this one is like that. Did I feel that even you Shivya were still looking for the perfect words….or maybe not…But yes i myself am lost for words.. Lovely, liked something immensely after a long long time,…. Beautiful images too, thanks a lot for sharing…. This is fascinating to hear. Lovely, and kind of sad, and yet somehow comforting… I’m not sure I can put it into words. Thanks so much for sharing. Awwww….heartbreaking indeed. Very well written, Shivya! A heartwarming story. Our environment is one of misguidance, and encouragement to crime. Good to know these innocent souls are on the right path, we need to learn from them. I really can not express, how much I enjoyed and that is not even the right word for it, your post. I feel that this comes out from the deepest spot of your heart, named LOVE. It makes me wanting to hug all those young nuns and assuring that they will be okay in their lives.I am so searching for opportunities to photograph nuns like that and document it for the world. This is my deepest desire as a photographer. Sometimes we can’t see but there is always a blessing in disguise. Maybe they won’t get a better education or the love from their parents that they deserve because of poverty and too many kids. And when they grow up and they don’t want to be nun.. they can escape.. where there is a strong will there is a way. In our normal life too we are all prisoners some break the shackles and escape, some want to break shackles but can’t and some don’t consider the shackles as shackles. Had a similar sort of experience in Rumtek Monastery, Gangtok, but of course I didn’t get a chance to spend 2 weeks with them. I can imagine the trance-like experience you’d have had. Beautifully penned, Shivya. You write so well. It’s true that the girls are probably being taken care of better than they would’ve been, if their families are too poor to afford good education, housing or healthcare, but any sort of a strict disciplinary regime being imposed on young kids (I’d even include extreme ballet/sports/math trainings that you hear prodigious kids being subjected to, from time to time) is sad because it takes away so much from their childhood. I hope when they grow up, some of these child nuns get to decide what they want to do for themselves. I don’t think it works that way, but I’d like to imagine that. This brought tears to my eyes. You penned your helplessness so beautifully. I couldn’t help thinking of child widows who were forced to shave their heads and live a life of servitude. I feel so bad for these little girls. However, I’m sure they were cheered and charmed by your big sister presence. Beautiful story. These exchanges are what travel should be about. Thanks for sharing! Reading this made me tear up. I love the pictures. There’s so much innocence in their eyes. I hope they have a good life, whatever the path they chose. This is so heart breaking, Shivya. It’s an unfair world. Very beautifully written. You have captured the emotions going through you very very nicely. I felt like i was there along with you. Beautiful Shivya.. Very Heartwarming indeed! But maybe it’s just heartbreaking for us, those outsiders, everyone has a different definition to freedom. I used to feel sad for this kind of things in my journey, yet I guess I can only accept the truth that I’m just seeing the world in my own eyes…..and then I will figure out how I can do for those people who deserve a better life. I felt as if I was right there, hearing their voices gazing at the stars and in absorbing all the desolation and surrounding I wanted to burst into tears. Our paths of life aren’t promised to be the same, but I pray that they each will have some goodness in theirs. And from one stranger to the next, thank you for bringing some newness and goodness to them as you did, because no matter the length of time, they will remember. Sometime you tend to leave a piece of your heart behind when you feel so deeply touched by the innocence of the place and its people. Previous PostThe Joy of Slow Travel. Next PostTravel Contest: Win an Epic Trip Through Kashmir and Ladakh!